This lesson demonstrates a ' 3 chord trick ' americana style song using the angled slide with right hand arpeggios giving a picking accompaniment feel to the slide melody. I have no idea where this tune comes from - I may have made it up or it may be something that I heard years ago - In which case I'm probably playing it wrong ! The idea here is to get an arpeggio going ( Not necessarily the same as mine ) before you start playing the slide melody and then try to keep it going underneath the tune. This is not always possible - so , for instance ,when I'm getting the note at fret 9 in bar 3 the chord should be created by the slide at fret 7 but as my melody note is at fret 9 there's no way I can do both. The bottom string open is the only option here. When the chord is on fret 5 or fret 7 I have the slide covering the top 5 strings. I use my R/H thumb to get root notes and index finger mostly to get the arpeggio and the melody. Remember that your root notes are on the 5th string in this tuning but that when you're on the D part of the sequence the bottom string open can come into play. 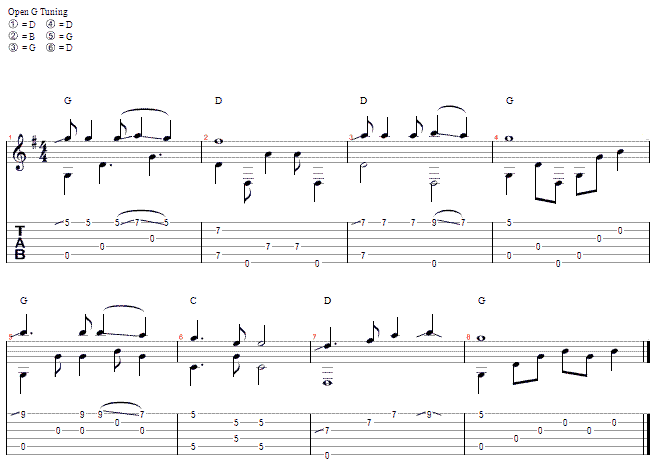 The top line of the Tab/Score is the slide melody - all the other notes are bass notes/arpeggios. Once you've got the hang of this style of playing you could try giving the same treatment to any fairly slow 3 chord trick song.